Enjoy the U.P. in the springtime by participating in a bus tour of local springs and waterfalls. This event includes a day long trip through Munising and Manistique where lunch, socializing and observing the beauty of the U.P. is provided for all. 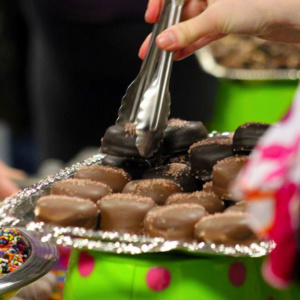 Enjoy a good ‘ole camp-out and sleep under the stars during this event with friends and family. Hosted at the AmVets Post 122 site in Ishpeming, this will entail a two day long weekend event of fun in the sun. Event may include kayaking on small pond, cookout, horseback riding, biking and hiking for all. U.P. Vets SERVED: Island Life! Masonic temple, 128 W. Washington st. Put your dancing shoes on. Come and join SAIL for a social event for everyone of all abilities. All Skills Levels are welcome! REGISTRATION IS REQUIRED contact Mo at 906-228-5744 for registration or if you have any question. Wretches and Jabberers poster This is a free event and is open to the public! This is a film event about Breaking Down the Barriers of Autism. All skill Levels and abilities welcome. REGISTRATION IS REQUIRED AND SPACE IS LIMITED. Call Mo at 906-228-5744 to register or if you have questions. REGISTRATION IS REQUIRED. Please call Mo at 906-360-7344 to register or if you have any questions. All abilities welcome! REGISTRATION IS REQUIRED. Please contact Mo at 906-228-5744 if you have any questions or would like to register. All skill Levels welcome! REGISTRATION IS REQUIRED. Call Mo at 906-228-5744 to register or if you have any questions. All skill levels welcome. REGISTRATION IS REQUIRED. Call Mo at 906-228-5744 to register or if you have questions. All abilities welcome! Lets get the creativity flowing. REGISTRATION IS REQUIRED. Please contact Mo at 906-228-5744 if you have any questions or would like to register. All abilities welcome! Lets get the creativity flowing. Classes will be taught by local artist Claire Moore. REGISTRATION IS REQUIRED. Please contact Mo at 906-228-5744 if you have any questions or would like to register. All abilities welcome! Lets get the creativity flowing. Classes are taught by local artist Claire Moore. REGISTRATION IS REQUIRED. Please contact Mo at 906-228-5744 if you have any questions or would like to register. Put your dancing shoes on! Come and join Superior Alliance for Independent Living for a social event open to everyone of all abilities. portage lake public library, 58 Huron St. Lets get outside and connect with nature. Join the SPAR program for fishing. All skill levels and abilities welcome. REGISTRATION IS REQUIRED. Call Mo at 906-228-5744 to register. All abilities welcome! Lets get outside and connect with nature. Join us for fishing. REGISTRATION IS REQUIRED. Please contact Mo at 906-228-5744 if you have any questions or would like to register. Ready to get outside and explore? We are too! Please join us for hiking. All skill Levels and abilities welcome. Locations to be announced upon registration. Call Mo at 906-228-5744 to register. REGISTRATION IS REQUIRED. Time to get Moving and Biking with Mo. All skill levels and abilities are welcome! We have adaptive bikes that we will be bringing to each county. Locations to be announced upon registration. REGISTRATION IS REQUIRED. Call Mo at 906-228-5744 to register or if you have questions. Time to get Moving and biking with Mo! All skill levels and abilities welcome! We have Adaptive bikes that we will be bringing to each county. Locations to be announced upon registration. REGISTRATION IS REQUIRED and space is limited. Locations and times to be announced upon registration. REGISTRATION IS REQUIRED. Please call mo at 906-228-5744 to register or if you have questions. Call SAIL at 906-228-5744 if you would like to register for the bus to the dance. It is $1 round trip. This event is open to people of all abilities..
Access for All – what does it mean? Trick or Treating at SAIL! 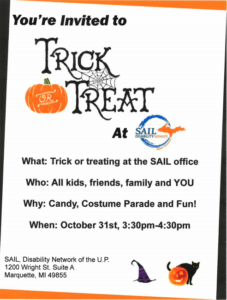 SAIL is Hosting a Trick or treating event for anyone in our community. We will talk about ways to put together quick and easy meals, choose healthier foods and save money in the grocery store. We will talk about ways to put together quick and easy meals, choosing healthier meals, and saving money in the grocery store. We will talk about ways to put together quick and easy meals, choosing healthier foods, and saving money in the grocery store. Locations will be announced upon registration. There may be a small cost depending on the location. Locations will be announced upon registration, there may be a small cost depending on location. Locations to be announced upon registration, there may be a small fee depending on the location. Interested in trying skiing or snowshoeing? Equipment is provided. Call SAIL at 906-228-5744 to find out more! Come join us and put on your dancing shoes! All abilities and skill levels welcome. Marq-Tran bus service available for $1 per person round trip. Call SAIL at 906-228-5744 to sign up for a spot on the bus. Space is limited! Interested in Skiing or Snowshoeing? Equipment is provided. If you have any question please call SAIL at 906-228-5744! Sled Hockey U.P. was formed to help everyone in the U.P. enjoy playing the sport of hockey, no matter what your abilities. We're based in Marquette, and want to expand our community to include the whole U.P. We supply all of the equipment that new players need to get started for free. All abilities and skill levels welcome! Please call SAIL at 906-228-5744 to learn more! SPAR event: Adaptive Dance in Ontonagon. Register by calling 906-228-5744 today! Native American Cultural Experience Flyer 03.16.19 First come, first serve! An event for veterans and military families. Lunch provided and come to learn about the Native American culture. For more information and to register in advance, please contact SAIL by calling 906-228-5744 or email: upvetsserved@upsail.org. All ages and abilities are welcome! Register for dance class by calling SAIL 906-228-5744. Class will be held at Bay College. First come, first serve! An event for veterans and military families. Lunch provided and come to learn about the Air Museum on the former K.I. Sawyer Air Force Base. For more information and to register in advance, please contact SAIL by calling 906-228-5744 or email: upvetsserved@upsail.org. First come, first serve! An event for veterans and military families. Lunch provided and come to see the beautiful and accessible Bond Falls in Ontonagon. For more information and to register in advance, please contact SAIL by calling 906-228-5744 or email: upvetsserved@upsail.org. First come, first serve! An event for veterans and military families. Lunch provided and come to explore the DeYoung Family Zoo. For more information and to register in advance, please contact SAIL by calling 906-228-5744 or email: upvetsserved@upsail.org. First come, first serve! An event for veterans and military families. Lunch provided and come to bike around Houghton. For more information and to register in advance, please contact SAIL by calling 906-228-5744 or email: upvetsserved@upsail.org. First come, first serve! An event for veterans and military families. Event to be determined. Lunch provided. For more information and to register in advance, please contact SAIL by calling 906-228-5744 or email: upvetsserved@upsail.org.